“Poor old GOBLIN, forever doomed to be “that underfunded railway which links the bits where poor voters live”. — Diamond Geezer. Kake Pugh’s picture shows the modest entrance to the GOBLIN’s Woodgrange Park. Our thanks and copyright acknowledgements to Kake for the use of her image. JB’s summary of the recent announcement by Philip Hammond raised the usual range of interesting comments for our assorted Anonymi and others. 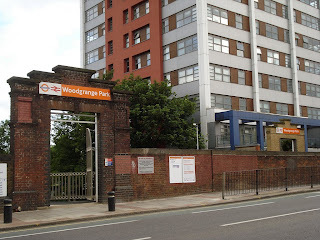 In particular, they drew attention to the fact that the Gospel Oak to Barking Line (GOBLIN) was missed out of the picture, yet again; despite being, in railway discounted cash flow, cost-benefit ratio terms, some of the lowest and cheapest hanging transport investment fruit in London. At this point it may be useful to refresh the memory as to why the GOBLIN can’t wait, although the GOBLIN has been featured on LR, several times already so I won’t go into depth covering old ground. In May 2010, we reported the introduction of new London Overground DMU stock as the class 172 came into service. On the 3rd August 2009 we reported on the intention to electrify part of the GOBLIN route for ECS (empty carriage stock) workings between the Midland and Great Northern main lines, as well as the row over Hornsey depot – (that is, as they say, another story to which we will return very soon). 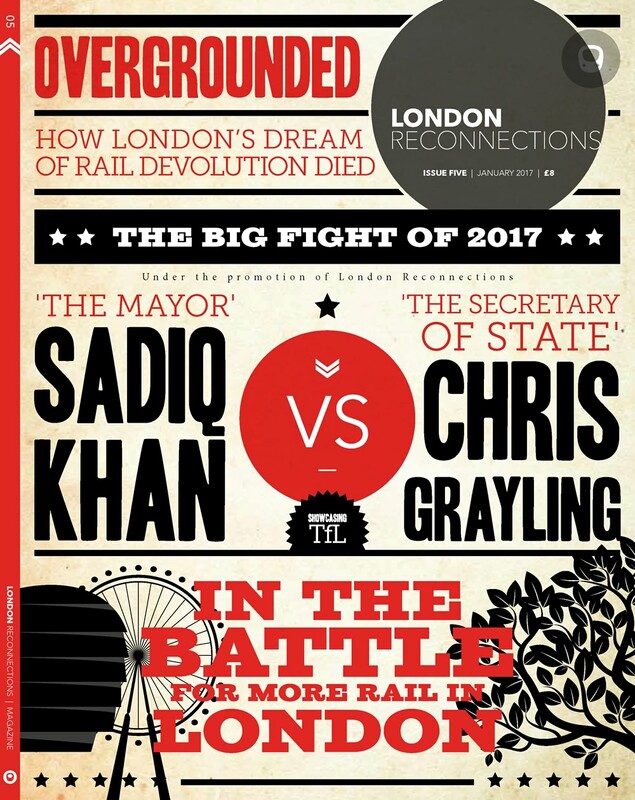 On 23rd June 2009, we reported that an offer by the DfT to put up £25 million towards electrification was rejected by TfL, who felt unable to pick up the balance of the tab. Finally, and importantly, on the 30th April 2009, we pointed out the potential impact of the new Thameshaven Gateway Port on the old Shellhaven refinery site near the London Tilbury and Southend Railway’s Tilbury loop close to Stanford Le Hope. Now forgive me if this sounds bossy, harassing, hectoring or even downright rude but for the annual City Hall Christmas Outing one good option may be for the Mayor, the London Assembly, a smattering of local MP’s, and the TfL board to borrow a non bendy-bus and take a trip down to the Thames Gateway Port in Thurrock. There they can take in a view from the top deck to see what is going on. Kidnapping a few members of the DfT Rail section from Marsham Street may also be an idea, although for reasons explained later they may need to make a telephone call first. 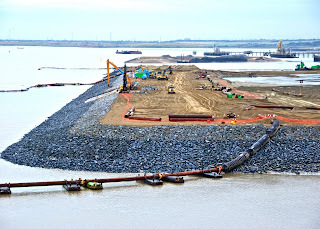 Major work started in earnest on the 16th March 2010 at the site of DP World – London Gateway, the UK’s new £1.5bn, 1500 acre, deep sea port and logistics park. The event had been marked by a Ministerial visit by Shahid Malik, the then Parliamentary Under Secretary at the Department for Communities and local Government when he viewed the highly visible array of dredging and reclamation plant being assembled on the shoreline. The “change the names and erase the tapes” compounded by the “the only thing that can be said about our agenda is that it is not their agenda even if the facts on the ground are the same” processes that follow every General Election, where there is a handover/takeover of power, may well have kicked in , impeding DfT’s judgement. The works underway include dredging and reclaiming land from the Thames Estuary to allow the world’s largest container ships to bring consumer goods closer to the point of consumption than existing major national deep water ports. DP World is one of the largest marine terminal operators in the world, with 49 terminals and 12 new developments across 31 countries. It employs a team of nearly 30,000 people and serves customers in some of the most dynamic economies in the world. In 2009, DP World handled more than 43.4m TEU (20 foot container equivalent units – a measure based on a largely obsolete container size once in general use – rather like the petroleum industries measure of crude oil – the barrel) of containers across its portfolio from the Americas to Asia. With a pipeline of expansion and development projects in key growth markets, including India, China and the Middle East, capacity is expected to rise to around 95m TEU over the next ten years. That by reducing the transportation required to move goods across the UK, transport planners predict some 65 million road miles will be saved in the UK every year, equivalent to some 2,000 trucks per day off the national road network. This equates to some 148,000 tons of CO2 that can be saved every year. Simon Moore, CEO of London Gateway, told the media at the time, ‘We are creating a world class shipping lane, which will allow the world’s largest container ships to dock alongside one of Europe’s largest logistics parks. 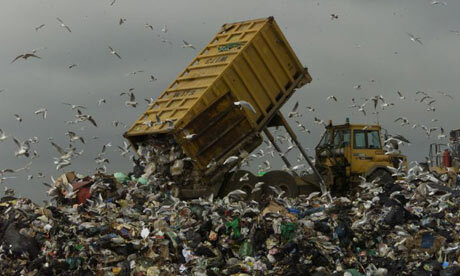 Our aim is to ensure the distribution of goods becomes more efficient and environmentally friendly. We are now in discussions with potential occupiers for the London Gateway Logistics Park as well as shipping lines for the port and look forward to working with them to improve the way we move products for both importers and exporters. Serious stuff is happening down there. Dredging of the new channels is now well underway with the recovered material being used to build the berms and quoins. 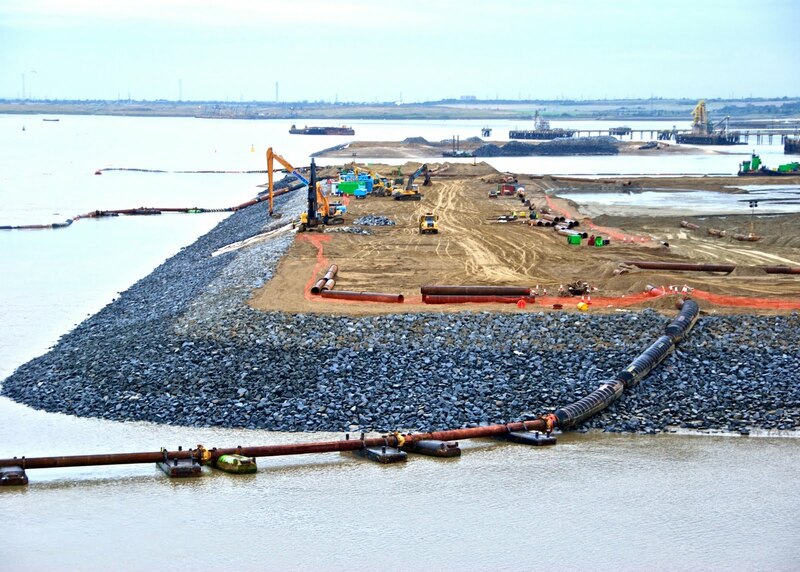 Laing O’Rourke Infrastructure Limited and Belgian specialist Dredging International NV (DEME Group) are responsible for dredging and construction at the Essex site, under a joint venture contract valued at £400m. When completed the new deep water port, the largest to be built in the UK for more than 20 years, will be capable of handling the world’s largest container ships and be capable of receiving 3.5 million containers a year. The site will be raised by three metres and the wharf, extending up to 600m into the estuary, will be built on reclaimed land. A separate logistics park, originally planned to be 9.5m sq ft in size, is set to be built under a separate construction contract. Laing O’Rourke, with Bachy-Solétanche as subcontractor, is also building a new 300m long oil jetty at the eastern end of the site to serve Shell’s remaining activities in the area. Work on the jetty is already well advanced and is a hive of activity with jack-up platforms, tugs and barges operating on site. Considerable preliminary work has already been carried out including clearance operations and environmental preparations on the former Shell Oil Refinery site at Shellhaven. Millions of pounds have been invested in a world class environmental management programme and, already, over 50,000 animals have been re-housed from the site. A team of 25 ecologists has collected thousands of animals from across the site including water voles, Great Crested Newts, adders, grass snakes and lizards. New nature habitats are being created in which to re-house the reptiles, each of a different character, which will accommodate a variety of wildlife that had moved into the derelict land of the former oil refinery. The main dredging and construction works are to be completed over a period of 54 months from the start of dredging, setting a deadline of the end 2014. A significant number of dredgers and other plant from the Dredging International – DEME fleet will be involved in the project. A major element will be the construction of the 1,300m quay wall accommodating six large container berths and a two berth Ro-Ro facility. Some 29m cu/m of capital dredging and reclamation work are included, with trailing suction dredgers operating in the Thames over a distance of approximately 100km. Preparatory works, including soil investigations and the set up of an impressive river monitoring system were carried out in 2008 and 2009. Actual dredging operations were due to start in March of this year shortly after the arrival of a sizeable package of floating plant. An important part of the Dredging International workload will the construction of bunds, slope protection works and the installation of Fibrous Open Stone Asphalt (FOSA) mattresses for erosion protection. Spoil from the trailing suction dredgers will be used for the bunds and later, land reclamation. Dredging in the shipping channels will provide unprecedented access for deep draft container ships. Don’t necessarily get too bogged down in the detail but please note DWP have put together a world class team of specialist contractors who, baring catastrophes beyond their control, have a reputation for getting the job done on time and on budget. This means that very shortly, in transport infrastructure development terms, big, big ships will be docking in the Thames loaded with thousands of containers – the vast majority of which will need to leave the site by either road or rail. The success of the port will hinge on the effectiveness of its surface access strategy. I suspect at this point that LR readers are ahead of me in wondering where these containers are going to go and how. Much of the traffic from the port will inevitably be road based; the majority of all containers imported into the UK are delivered to final destinations in London and the South East. There still is, however, a substantial number that have to travel across London and the South East to reach the East Coast, West Coast and Great Western main line railways or motorways – the access routes to which are or will be subject to significant congestion. The development of the Thames Gateway is not taking place in isolation. Similar developments are taking place at both Harwich and Felixstowe – the Haven ports. As part of the development of the latter, the Government has insisted on substantial investment in surface access infrastructure. This includes the creation of the F2N, the remodelling of the rail route from Felixstowe to Nuneaton via Ely, Peterborough and Leicester, cleared to carry 9 feet 6 inch tall containers. Such containers are rapidly becoming the world standard size – the earlier generation, of 9 feet, containers have been widely phased out during the recent shipping recession because of their reduced capacity per container – This is analogous to the way airlines scrap older less economic aircraft during an economic downturn. “>there are already concerns being expressed that the Haven Ports expansion might trigger such a silting up effect. DWP are not the only people seeking to enlarge Thurrock. The Mayor and the population of London are building an 845 acre nature reserve there by selflessly donating their unrecyclable rubbish. Brought in by environmentally friendly barges, the foundation stages of this project will be completed in the next three years. There is, therefore, a delicate question of etiquette that arises before the Mayor – in command of our previously mentioned City Hall bus – issues the instruction to the coach driver to head Thurrock-ward. It would be undoubtedly appropriate to call the Mayor of Thurrock and sound out his views on a range of issues, including such matters as the restoration of the Mucking Marshes Landfill Site – possibly offering to re-house its over-spill seagull population, a joint way ahead on the Dartford Crossing and any new bridge. Offering to rename the existing bridge and tunnel, the “Dartford/Thurrock Crossing” might be a start. The crossing is a topic; we shall be covering shortly in a separate article. A little tea cup diplomacy may be called for. London’s Mayor should be able to assess the success of any talks quite easily. If his hosts move the biscuits back to their side of the table – that’s not a good sign. If they insist on arm-wrestling him for his tea cup, he should, true to his journalist’s traditions – make his excuses and leave to avoid unnecessary dry cleaning bills. The import thing is that the GOBLIN could – and should – be a vital part both of the plans for the Thames Gateway as well as part of an extended London Overground “Outer Circle.” For both to succeed, its upgrade is required, or both Thurrock and London will ultimately lose out – a no-win situation for all involved. The Box, How the Shipping Container made the world smaller and the world economy bigger. – Author: Marc Levinson – publisher: Princeton University Press – 2006 – ISBN 10 0 691 12324 1.